Two days ago, we posted an interview my son did with his favorite author, David Lubar. 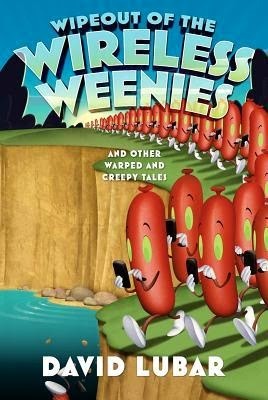 Here is his review of the Wipeout of the Wireless Weenies, the latest in the Weenies short story series. This book comes out on April 11. (The book level is for for ages 8-12, grades 3-7). David Lubar’s books are a collection of short stories. What I really like about them is that all the characters are different, settings are different and timing might be different. The stories don’t usually have anything to do with each other, other than themes like revenge, carnivals, death or something like that. Some are really creepy and have a chance of giving you nightmares. Others end up with a happy ending or semi-happy ending. There’s always a twist to the story that you’re never expecting. The only real difference between this book and others were that there were major twists instead of minor twists that you couldn’t see coming whatsoever. Sometimes it’s nice to figure things out. I really loved Mr. Chompywomp. In that story and in some of the other stories, it says “don’t bully or you might end up like this” even though you know it won’t really happen. It’s really fun to think about. You could feel how the characters are feeling, like when she’s revealing a secret I had a smile on my face even though I didn’t know what was coming next. I just thought it was going to be amazing (and it was). The story about the zombie apocalypse – I loved how you can figure things out on your own instead of just having it said to you, like happens in a lot of other books. In Rough Road, I like how you can turn the regular world into an opposite through fantasy. David Lubar might write a story about a kid who lives in a world where apples are poisonous, who is reading a book about a world where apples aren’t poisonous. He can turn the tables on a story about human dimensions and opposites. They’re amazing stories by an amazing author. To learn more about David Lubar and his books, click here.